Deer Island in Biloxi, MS was first occupied by American Indians and then Europeans in 1717. It was used for fishing and farming in the 18th and 19th centuries, and was even home to an amusement park in 1915. The island’s residents left after Hurricane Camille in 1969. The narrow, four-mile long island is essentially a relic of the mainland and not a true barrier island. In the mid 1800s, Deer island was nearly twice its current size. With an average loss of two acres per year and rising sea levels, land-loss is the island’s greatest threat. 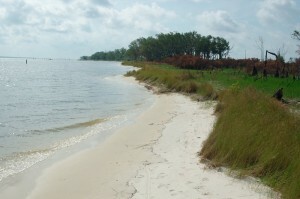 Following Hurricane Katrina, a breakwater was constructed and placed south of a large breach in the island to slow erosion and enhance recreational fishing. Many local residents and tourists enjoy camping and fishing from the island. Each year the City of Biloxi uses the island to display its huge 4th of July fireworks show.